Red Lobster enters the holiday season with the release of their limited-time Ultimate Surf & Turf menu, featuring various seafood and steak pairings. 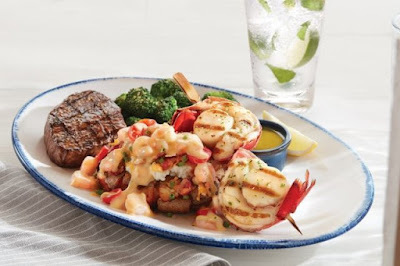 - New Surf & Turf Feast - Grilled Maine lobster and sea scallops skewer, a choice from three wood-grilled steaks, and a Norway lobster-and-shrimp loaded smashed potato plus a choice of side. - New Lobster and Seafood Topped Steak - Steamed Maine lobster tail, a choice from three wood-grilled steaks topped with creamy langostino lobster plus a baked potato and choice of side. - Classic Surf & Turf - Steamed Maine lobster tail, a choice from three wood-grilled steaks, and mashed potatoes, plus a choice of side. - New Grilled Sirloin and Red Shrimp - Wood-grilled top sirloin steak, a grilled skewer of wild-caught jumbo red shrimp, mashed potatoes, and a choice of side. - New Grilled Sirloin and Fried Shrimp - Wood-grilled top sirloin steak, battered and fried shrimp, mashed potatoes, and a choice of side. - Steak & Southern King Crab - Southern King crab legs paired with a choice of three wood-grilled steak options, while supplies last at participating locations. Steak choices include filet, top sirloin, or New York strip steak. 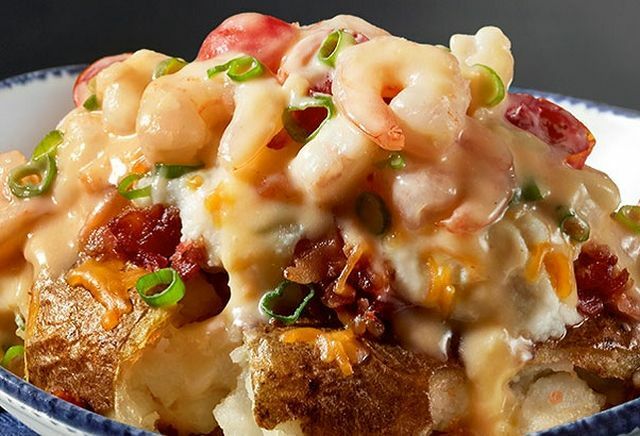 - New Norway Lobster and Shrimp Smashed Potato - A baked potato that is smashed and then fried, and then topped with mashed potatoes, cheese, bacon, and a creamy blend of Norway lobster and shrimp. - New Crispy Crab Bites - Panko-crusted and fried crab-and-corn bites served with fries, tartar sauce and ketchup. - New Tiki Passion Punch - Sailor Jerry Spiced Rum, pineapple juice, and Sprite mixed with a mango passion fruit puree. - New Berry Cosmo - Absolut Citron vodka and Cointreau, cranberry juice, and fresh-squeezed lime.